Mr. Andrew Pringle, Chair of the Board of Directors of the Canadian Foundation for AIDS Research (CANFAR) is pleased to announce a $1 million donation by the Slaight Family Foundation on February 10, 2016. “While we have several supporters who have contributed $1 million or more – over time, this is the largest single gift in CANFAR’s history. This donation will greatly expand our exceptional youth HIV awareness program,” says Pringle. 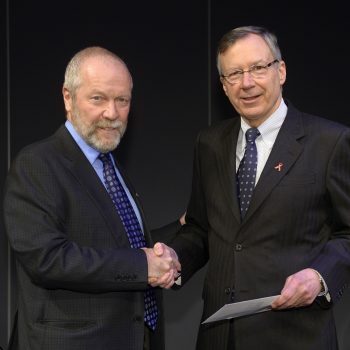 Gary Slaight (left) from the Slaight Family Foundation generously donates $1 million to enable CANFAR to expand its HIV youth awareness activities, presented to Christopher Bunting (right), CANFAR’s President and CEO. CANFAR will expand its outreach in schools and develop relationships with community-based organizations. The overall goal will be to develop long-standing, meaningful partnerships that are responsive to the unique needs of each community and the vulnerable population they serve. CANFAR will continue to build on its community partnership across Canada, refining the necessary tools and resources and ensuring input from those at the front lines. Youth will play a fundamental role in shaping these resources. The program will be developed within a consultative framework allowing youth to be thought and implementation leaders. Through community partners and technology, educational resources will be readily available across Canada in print and digital format. CANFAR will continue to work with community partners to ensure the youth awareness program is sustained and responsive for the future. To see the One and All awareness and prevention program that CANFAR has developed, visit CANFAR.com/OneandAll.